Yen Giang stake yard, Quang Ninh province (photo by Mark Staniforth courtesy of the Bach Dang River and Van Don Research Team). The naval battles fought at Bach Dang River demonstrated the strength of Vietnam as an independent nation; this is where the forces of Dai Vet repelled invading enemies not once but several times. In Vietnam, two battles, in the tenth century against the Chinese as well as in 1288 A.D. against the Yuan Dynasty fleet sent by Kublai Khan, are significant. It is said that these battles employed the strategy of secretly planting large wooden stakes into the riverbed and then lure the fleets into a trap. Dai Vet generals that led the Vietnamese forces to victory, Ngo Quyen in the tenth century and Tran Hung Dao in the thirteenth century, are remembered as the country’s greatest heroes and continue to be worshipped to this day. According to Vietnamese accounts regarding the battle undertaken in 1288 A.D., the fleet of more than 400 ships was destroyed near the mouth of the Bach Dang River, right before reaching the safety of open water as they were retreating from the capital. In the 1950s, many wooden stakes were found along the edge of the Song River near the town of Yen Giang in Quang Ninh Province. The town and the region are a famous center for Tran Hung Dao worship. 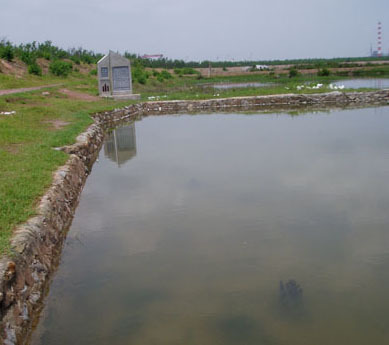 Vietnamese archaeologists have conducted several excavations and surveys at the concentration of the stakes to determine the details. Nowadays, it is concluded that the discovered wooden stakes are stake-yards representing the trap used during the previous naval battles. 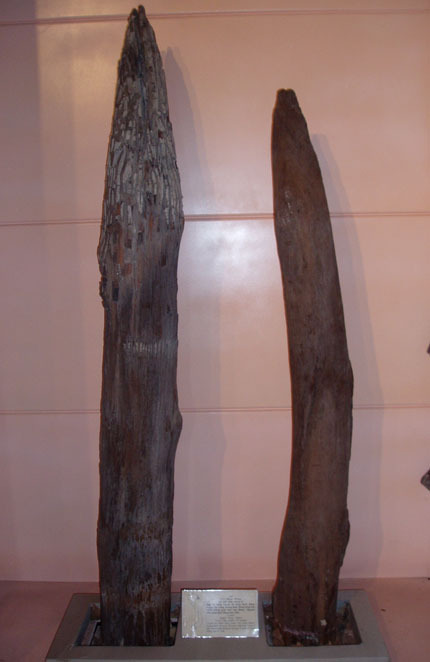 Some of these stakes are now displayed at museums across Vietnam, attracting many tourists. Despite the finding of the numerous wooden stakes, the reconstruction of the naval battle sites has room to be analyzed in details, in particular, relevant to more recent discoveries. Stakes on display in the Vietnamese National History Museum in Hanoi (photo by Mark Staniforth courtesy of the Bach Dang River and Van Don Research Team).